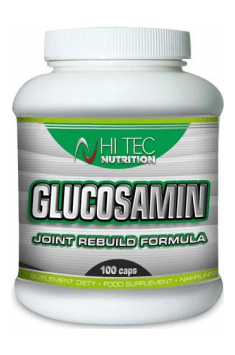 Glucosamin by Hi Tec Nutrition is a dietary supplement which contains highly bioavailable glucosamine responsible for healthy and strong joints. Each serving provides 1,500 mg of glucosamine. The formula has been enriched with vitamins C and E which show antioxidant properties and can regenerate joint parts. Glucosamine – is an organic chemical compound from the group of amino sugars, synthesised from glucose. It is actively involved in the production of proteoglycans (substances forming joint cartilage), which leads to strengthening and better regeneration of joints. Vitamin C – also known as ascorbic acid. It is an organic chemical compound from the group of unsaturated polyhydric alcohols. Vitamin E – a group of fat-soluble compounds called tocopherols. It is a strong antioxidant, a substance which ensures a balance between antioxidants and free radicals. Who will benefit from glucosamine use? Glucosamine is recommended for athletes whose joints are exposed to a risk of burden and different injuries as well as for people in the periods of intensive physical activity. The product can be also used by obese and elderly people, as the level of glucosamine in joints constantly drops with age. Glucosamine is also useful in the prevention of osteoporosis and for people who observe calcium deficiency. Numerous clinical studies have confirmed the effectiveness of glucosamine in humans. One of the longer studies which lasted for 3 years and was conducted on the group of 100 people proved that glucosamine products reduced symptoms of osteoporosis (pain and joint stiffness) as well as improved the condition of cartilage and other joint parts. Another study aimed at analysing reduction in gonarthrosis and inhibition of narrowing joint space width which is a symptom of joint degeneration. Glucosamine turned out to be effective in those cases. The aim for glucosamine use is mainly prevention of potential joint injuries as well as their fast and effective regeneration. Joint damage is a common problem especially among athletes and physically active people. Glucosamine seems to be promising in the posttraumatic regeneration. Due to its properties, it relieves pain and stiffness of joints, which is why it can be a part of the treatment of rheumatoid arthritis. It restores joint cartilage, as it stimulates the functions of cells involved in the formation of conective tissue. It can regenerate joints, which is why it is recommended in the periods of intensive workouts. It protects tissues from potential injuries, as it improves elasticity and motility of joint parts (fascia, tendons and ligaments). As it is responsible for water retention in connective tissues, it promotes maintenance of elasticity and bendability of joints, which in turn protects from injuries. Glucosamine shows also anti-inflammatory properties. It reduces the level of proinflammatory cytokines (cytokines IL-1 beta and TNF-alpha) which are responsible for chronic inflammations and promote activity of reactive oxygen species. To sum it all up, Glucosamin by Hi Tec Nutrition is a dietary supplement which contains high-quality glucosamine used for protection, regeneration and efficiency of joints, ligaments, fascia and other joint parts. The product is recommended for athletes, in the periods of intensive physical effort and in osteoporosis prevention. Take 1 capsule 3 times a day, after a meal. Take the product with some water. First application of a product containing glucosamine can result in gastrointestinal ailments, such as bloating, constipation, diarrhoea and abdominal pain. The symptoms should relieve after a few days. Anti-caking agent (magnesium stearate), edible gelatin.